340 mm/45 Mle 19123 х 4 pcs. Initial HE Shell Velocity921 m./s. Initial AP Shell Velocity780 m./s. 90 mm/50 Mle 19266 х 1 pcs. Initial HE Shell Velocity850 m./s. 139 mm/55 Mle 191018 х 1 pcs. 37 mm/50 CA Mle 192512 х 1 pcs. 13.2 mm/76 CAD Mle 19294 х 2 pcs. 90 mm/50 Mle 19306 х 2 pcs. 37 mm/50 Mle 19336 х 2 pcs. Normandie — French Tier VI battleship. The first French battleship design with the main battery guns placed in three quadruple gun turrets. The construction of such turrets was driven by the desire to achieve maximum broadside firepower given the ship's limited size. As the fastest Tier VI battleship — aside from Dunkerque — captains could be forgiven for considering Normandie a battlecruiser. She is arguably a better version of her premium counterpart Dunkerque, owing to her smaller profile, an extra main battery turret, better firing range, and better dispersion. She can easily chase down any retreating battleship and or cruiser ruthlessly, and give torpedo-based destroyers a hard run for their money. However, she is not without her own demerits. Although Normandie is very fast and has firepower on par with her Tier VI counterparts, she also poorly armored. Her armor scheme is similar to British counterpart Queen Elizabeth: a thickly armored exterior with a somewhat poorly armored citadel, making long range engagements potentially disastrous; especially when facing off against large caliber guns (380mm and up), such as those of the aforementioned Queen Elizabeth or even Tier VII American battleship Colorado. In addition to her somewhat weak armor, she also has very poor firing angles for all her turrets; she must expose a tremendous amount of her broadside armor just to able to fire the rearmost turret. However, Normandie’s fast rudder shift easily makes up for this handicap; captains who time their shots well can return to being angled towards their targets after firing a full salvo. In addition to her great rudder shift, Normandie’s turning radius is excellent for her speed, on par with American dreadnought New Mexico. Furthermore, her deadly array of secondary batteries can make quick work of enemy destroyers that venture too close, should captains invest in the relevant upgrades and commander skills for a secondary build; they are almost as deadly as Bayern’s. Unfortunately, her anti-aircraft suite is virtually useless; even Fuso sports more capable flak. In short, Normandie is a moderately-armored battlecruiser with great secondaries, main batteries, rudder shift time, and turning radius, but with below average armor and worst-in-tier anti-aircraft firepower. Her speed and rudder shift make up for her armor, but captains must learn not to always rely on her speed for everything. Main battery guns are decent: large number of barrels, standard rate of fire, best turret traverse for its tech tree ship type, great firing range, and good dispersion. Longest-range secondary batteries among Tier VI battleships. Excellent handling characteristics. Her turning radius and rudder shift speed give her handling comparable to high tier cruisers. Excellent speed. Normandie is the fastest of its tech tree type and tier. Lowest health pool of its ship type and tier, barely better than New Mexico’s stock hull. Torpedo protection is and her citadel is poorly-armored. Normandie can be easily penetrated by guns of 380mm and above from just about any angle. Poor main battery firing angles; Normandie has to show almost full broadside to fire all 3 turrets. Inaccurate, slow-reloading secondaries with small caliber: Bayern’s 150mm and New Mexico’s 127mm secondaries fire faster. Despite their large volume, Normandie’s secondaries inflict little damage. Large detection radius; only Fuso and Mutsu have worse concealment in the tier. Hull: Upgrade to Hull (B) for additional hit points, quicker rudder shift time, and a cosmetic re-arrangement of her AA guns that doesn't substantially improve her AA armament. Research of this module unlocks progression to Lyon. Gun Fire Control System: Upgrade to PCA n° 6 Mle 2 for an extra 10% range on the main battery. Propulsion: Upgrade the propulsion module for a 1.5 knot speed increase. Early experience gains should go to Hull (B) for the additional hit points. After that, captains should decide which they value more: the extra speed or additional main battery range. Due to Normandie’s already great rudder shift time — once Hull (B) is installed — players can opt to replace Steering Gears Modification 2 with either Propulsion Modification 2 ( ) or Damage Control System Modification 2 ( ) (the latter is recommended). Key skills for Normandie commanders include Expert Marksman, Basics of Survivability, and Fire Prevention. Players who wish to spend doubloons can equip Normandie with Type 16 camouflage that lowers her detection radius, reduces the accuracy of incoming shells, reduces her repair costs, and increases the amount of experience she earns. The Normandie class of dreadnought battleships was a group of five ships ordered for the French Navy in 1912–13. The class comprised Normandie, the lead ship, Flandre, Gascogne, Languedoc, and Béarn. The design incorporated a radical arrangement for the twelve 340 mm (13.3 in) main battery guns: three quadruple gun turrets, as opposed to the twin turrets used by most other navies. The first four ships were also equipped with an unusual hybrid propulsion system that used both steam turbine and triple expansion engines to increase fuel efficiency. Ordered on 12 December 1912, this project was developed using Bretagne as a basis; it would be the first time in history to mount the main guns in quadruple turrets (by pairs in two gun slides, each one weighing 1,500 t), electrically trained and hydraulically elevated. Each pair of guns had its own ammunition hoist and magazine, and hosted secondary gunnery control stations. The guns would have a firing range of 16km and a rate of fire of two rounds per minute. Five range-finders (two on the conning tower, three atop each turret) provided fire control for the main batteries. The secondary battery would consist of twenty-four 138.6 mm /55 Modèle 1910 guns, each singly mounted in casemates in the hull. The four-shaft machinery included would utilize the VTEs for cruising. The ships, named after provinces of France, were never completed due to shifting production requirements after the outbreak of war in 1914. Normandie was never commissioned let alone saw combat. 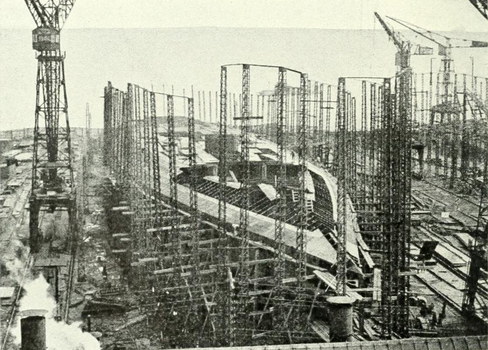 Construction came to a halt in January 1918, with Normandie’s hull 65 percent complete, her engines 70 percent complete, the turrets were 40 percent assembled, and her boilers delivered but were instead installed in new destroyers. The first four ships were sufficiently advanced in construction to permit their launching to clear the shipyards for other, more important work. Many of the guns built for the ships were instead converted for use by the Army. After the war, the French Navy considered several proposals to complete the ships, either as originally designed or modernized to account for lessons from the war. The weak French post-war economy coupled with the Washington Naval Treaty of 1922, however, necessitated that the first four ships be broken up for scrap. The last ship, Béarn, though not significantly advanced at the time work halted, was converted into an aircraft carrier in the 1920s. She remained in service in various capacities until the 1960s, and was ultimately scrapped in 1967. 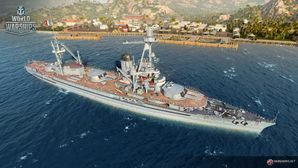 Normandie in World of Warships is Wargaming's interpretation of the French battleship. Her appearance is heavily fictionalized and her in-game stats have been altered for balance purposes. Normandie’s original design is not represented. Artist's impression of a Normandie-class battleship. CG-rendering of the Normandie class, showing the arrangement of the primary and secondary batteries. 3/4 view of the Normandie class. French aircraft carrier Béarn underway in 1939. Béarn conducting air operations, date and location unknown. A Levasseur PL.10 reconnaissance biplane takes off from Béarn’s flight deck, date unknown. This page was last modified on 6 April 2019, at 17:59. This page has been accessed 50,020 times.